PENSACOLA – Committed. Collaborative. Creative. Responsive. Proven. These are the pillars of Clark Partington, but also the Greater Pensacola community. As a city with deep historical roots, we stand on the shoulders of those who laid the foundation for the wonderful success that our community enjoys today. Clark Partington has been shaped by this legacy, and it is driven to form lasting relationships with the community to ensure that Pensacola’s success endures for generations to come. On February 21, the Pensacola community gathered to recognize eight entrepreneurs, leaders, and exemplary corporate citizens at the Pensacola Area Commitment to Excellence (PACE) Awards. These eight individuals have made significant contributions to the Greater Pensacola area’s overall economic progress in many ways; from exemplifying a spirit of service, to developing new products, and providing outstanding leadership with a lasting impact, Clark Partington applauds the excellence each Award Winner has shown in their profession, and in the community. 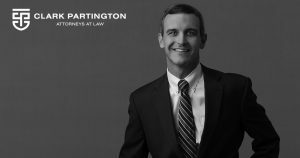 The 2018 PACE awards gave Clark Partington a unique opportunity to celebrate: Clark Partington Attorney, Douglas A. Bates, received the award for Emerging Leader of the Year. President Scott A. Remington noted, “While our clients live at the center of our mission, we know we are only as strong as each member of our firm. Doug is one example among our 41 attorneys and 62 staff, of the can-do, will-do spirit that makes our team, and community, strong.” Doug Bates joins an impressive group of Clark Partington attorneys who have won PACE awards including Dennis K. Larry and Robert D. Hart, Jr.